Join photographer Ron Herman on a 15-day U.S. government-approved educational program to Cuba. This trip will focus on the eastern side of Cuba, known as El Oriente, which is considered by many to be the most interesting region because of its natural beauty, Afro-Cuban roots, musical heritage, and revolutionary history. With gorgeous coastlines, imposing mountains, and colorful towns that mass tourism has yet to discover, this region retains an unfiltered essence of authentic Cuba. 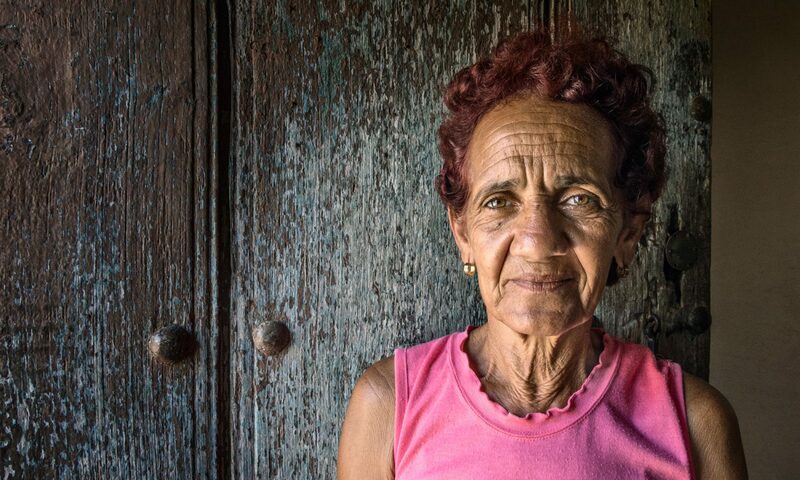 The special itinerary designed for this program offers participants endless cultural and photographic opportunities to discover the beauty of the less traveled side of Cuba and experience the warmth of its people. You’ll arrive in Holguin, the nation’s fourth-largest city. Downtown Holguin is known as the city of parks, and you’ll explore the parks bybicitaxi while capturing Holguin’s easygoing charm with your camera. You’ll then proceed to Gibara, which The Guardian called “Cuba’s best-kept secret.” Cut off from train service—and seemingly the rest of the world—in 1958, this fiercely independent coastal fishing village is filled with charming squares and Spanish-era buildings on a cobalt bay. Here you will visit a cigar factory and engage with local fisherman and their families, who are eager to share stories about the catch of the day. Next, you’ll travel to Baracoa, Cuba’s oldest and most isolated town, located at the easternmost tip of the island. The natural beauty of Baracoa is unsurpassed, and you’ll quickly understand why, after landing here in 1492, Christopher Columbus wrote, it is “the most beautiful land human eyes have ever seen.” You will take a traditional canoe on the Toa River, which flows throughout Cuchillas del Toa Natural Biosphere Reservoir (UNESCO), and provides a perfect view of majestic El Yunque Mountain. The world’s most colorful snails can be seen in this region. Afterwards, you’ll enjoy a traditional Cuban farmer’s lunch (pig roast) at a local ranch. Baracoa’s tropical climate makes it ideal for growing cocoa, which is why Baracoa is at the center of Cuba’s chocolate industry. You’ll visit cocoa farms and coconut plantations, where you’ll meet the campesinos and learn about their life on the frontier. Considered the cradle of the Cuban Revolution, Santiago de Cuba is steeped in history, but is also the birthplace of nearly all of the island’s music, including son. With its Afro-Cuban origins, religion, music and dance dominate this region, and will be the emphasis of our photographic excursions. You will learn about Santeria, the Afro-Cuban religion which combines elements of Catholicism with the Yoruba religion, and will visit the Shrine of the Virgin of Charity of El Cobre, which attracts people from all over Cuba who come seeking the Virgin’s purported healing powers. You’ll take a boat ride over to Cayo Granma, a small pedestrian only island full of red-roofed wooden houses – many of them on stilts above the water – that guard a traditional fishing community. When you arrive in Bayamo, the second city founded by the Spaniards, in 1513, you might think you’ve stepped out of a time machine. Known as the “ciudad de los coches” (city of horse carts), Bayamo is an easygoing, slow-paced city where half the population still use horse carts as a form of transportation. With deep historical roots, Bayamo is recognized as the birthplace for Cuban independence, and where the notes of the national anthem were first sung. You’ll partake in Bayamo’s unique Saturday night street party (Fiesta de la Cubanía), that is unlike any other festival in the country. It includes the locally famous pipe organs, dancing, people playing chess, whole roast pig, and an eye-watering oyster drink called ostiones. You’ll explore nearby Las Tunas, which has been dubbed El Balcón del Oriente (The Balcony of the Oriente), thanks to its location, marking the divide between western and eastern Cuba – both geographically and culturally. Also commonly known as the “City of Sculptures,” the city streets are decorated with more than 100 sculptures. The trip will end in Havana for a 3-night stay to enjoy the artistic vibrancy of the capital city. You’ll ride in a classic American car down the famed Malecón and you will go on guided photo walks exploring Havana’s vibrant street life and visiting local markets. The relationships I have developed over the years will allow you to go beyond the traditional tourist destinations, and into the homes and studios of Cuba’s leading artists. You’ll enjoy a private rooftop jazz concert and experience Cuba’s burgeoning free enterprise scene at private restaurants (paladares). In addition, The Havana International Jazz Festival sponsored by famed Cuban jazz pianist Chucho Valdes, and the Havana Film Festival will both be going on during this time, offering a plentitude of interesting performances and screening events throughout the city. This will be a small group tour (10-15 people). The small group size is designed to get participants into unique, engaging locations and to allow for a more rewarding and fulfilling experience. Space is limited and can only be held upon receipt of registration form and deposit.